There is nothing more daunting for a teacher, than sitting down to write unit lesson plans for the first time. Even those of us who are experienced, can feel the stress when we take on a new subject area. Where to begin? What should I include? What do my administrators require? What do I need for actual teaching? How long should I spend on this unit? Which is why we often reach out to our veteran colleagues. And rightfully so. After all, they do hold the experience that we so desperately desire. Hopefully you have veteran colleagues you can call on to help. They may even be willing to sit down and help you plan. However, I know from experience that this is not always the case. Sometimes there is no one else teaching the same thing as you. Sometimes your colleague may be just as inexperienced. Or perhaps, the only veteran teacher around isn’t really a planner or even has a clashing personality. When I first started teaching 6th grade, it was my very first teaching job. It was at a private school, where there was barely a curriculum guide and no textbooks. I was completely on my own. While there were two 6th grade teachers, I was responsible for teaching social studies to both classes. The other teacher was assigned to teach science. All I knew is that I was supposed to teach about a list of ancient societies. Personally, I was not a history buff and knew the bare minimum of world history. Let’s just say, it was a crash course for me. 14 years later, still teaching 6th grade, and primarily social studies at that, and I can now write my unit plans from memory. A lot has changed, I now have new teachers knocking on my door and asking for help. And I am happy to welcome them to my planning desk and lend a guiding hand. I hope new teachers are not experiencing what I went through. Though it’s sad to think there are teachers out there who are. This post is for you – I’ve taken what I struggled to learn, comes so easily for me now, and put it in what I hope is an easy to follow format for any teacher who may need it. There are teachers who “wing it” each day and there are teachers who plan “everything” even the greatest detail. I’m the type of person who needs to “see the movie” in my head before I commit. Which means, I need to see all the moving parts and know what my classroom is going to look like in action. While I may only put a fraction of my plans down on actual paper, you can rest assure I can already see my instruction playing out in my mind. I could never be a “wing it” teacher. I just don’t have it in me. Even if my original plan fails – I have a back up activity, just in case. Having your lesson plans written out is a huge stress reliever. In a profession where stress can be a daily occurrence, it seems common sense to relieve it where we can. Lesson planning is one of those areas we can control. Having your lesson plans done also allows you to be prepared even on mornings where there’s an emergency meeting called and you end up with exactly 2 minutes before you have to start teaching. Lesson planning is also a huge confidence builder for you. When you’re plan is laid out, you can deliver your lesson in confidence, knowing you’re teaching what you need to and not wasting time. What you write in your lesson plans largely depends on what your administrators require of you. During my 15 years in the classroom, I've worked for 8 different administrators. I doubt most of them ever really looked at my lesson plans, apart from observation time. Once I finally realized this, I stopped writing lesson plans for them and started writing them for myself. I include the 3 requirements of our district: objective, delivery details, and assessment. Which ultimately meant I included my daily objective, materials I needed for class, and individual student assignment/homework. Please note that any time I require a substitute, my lesson plans look drastically different. They are way more detailed. But for my unit lesson plans, I find this is all I need. Related: Read more about creating Effective Emergency Lesson Plans. My planning always begins before the first day of school. I use a calendar that contains all the months of the school year. FIRST– I fill in the school calendar dates. SECOND– I look at how many units I need to teach – for ancient civilizations, it’s 8: Early Man, Mesopotamia, Egypt, India, China, Greece, Rome, and the Americas. Which equals, 2 units per quarter, since our district operates on 4 quarters a year. Since each quarter is roughly 9 weeks long, each unit becomes 4 ½ weeks long. Using this information, I pencil in my start/end dates for each unit. THIRD – While the following certainly isn’t necessary, it is my personal preference. I start each unit fresh on a Monday. I schedule my unit tests on a Thursday. A note about Thursday Test days – you have a larger chance of students being in attendance. I found Mondays and Fridays to have more absences since they frame the weekends. On Friday after test day, I always show a movie (educational film) about the unit we just studied. This has 2 benefits: it is the perfect make-up test day, since students weren’t missing anything new and it gives me time to grade before starting a new unit on Monday. Step #1 – Pencil in your start and end dates using your year plan. Mark your start date on a Monday. This day will include a high engagement introductory activity and include the society’s location. Read more about teaching location using maps with ancient civilizations HERE. Mark your unit test on a Thursday. The following Friday is a movie/make-up test day/grading day. Step #2 – Pencil in a Review Day. This could easily be included in step #1. However, it is so important and crucial for your students’ success that I include it as its own step. Plan for at least one, if not two review days prior to test day. Read more about how to create effective study guides HERE. Always begin your first day with location. Every society, city, or village has a location. It is not part of the definition of a civilization. However, location highly affects agriculture, which is why Food Supply is first on the list. Next comes Government because it is often one of the largest and most complex parts of a civilization. Covering it early on in the unit gives more opportunity to review and grasp understanding. In ancient times, Religion was often entwined with Government. Which is why it comes next on the list. Consider reading King Gilgamesh when you start your Mesopotamia unit to help illustrate this point. Read more HERE. Written Language is one of the most crucial components of what makes a civilization. Social Structure defines the level of importance each citizen played in their society, and dictated how they lived their daily lives. Finally, Technology and Arts are what occur when a civilization is thriving. All of their basic needs are met and people have time to work, build, invent, and design other things in their time. Read more about how I introduce the 7 part structure to my students using Mesopotamia, HERE. Step #4 – Plan two days for each of the 7 parts. I reserve one day for an exploration (first day) or an application (second day) activity. The other day includes reading, note-taking, and vocabulary work. Once you begin to use this structure, you will find that each society becomes a “plug and chug” session for you when you go to lesson plan. Insert different lessons/activities depending on what resources you have available to you. Any activities or lessons you have that include multiple parts of the 7 part structure are best used as introductions, reviews, or on the second day after an element has been introduced to your students. Be sure to include the textbook! Learning to use a textbook is an important skill for your 6th graders, who probably don’t know how. They will thank you one day when they are in high school or college and are responsible for their own textbook use. 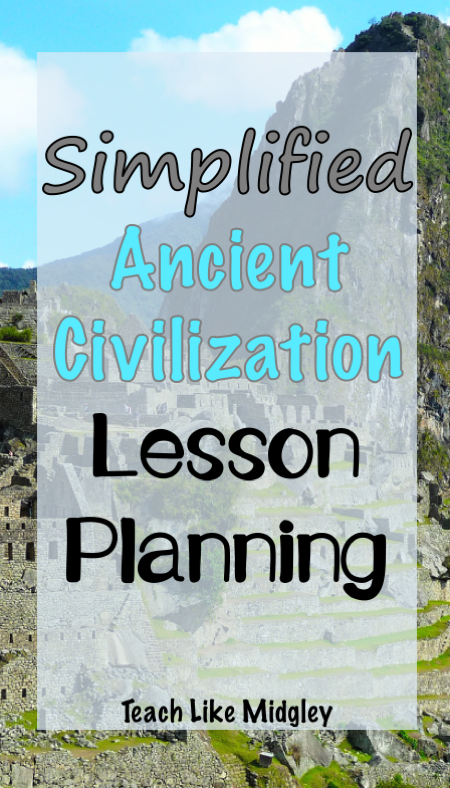 In case you are someone like I was – a new teacher with limited world history knowledge – I have just what you need to complete your lesson planning venture. Let me make things even less stressful for you with my unit planning checklists all filled out! No more guess work – an exact list of what you need to teach your 6th graders about ancient civilizations. You can purchase my Unit Planning Checklists all filled out and ready to make your lesson planning session run even smoother.